What is the estimated open rate for an email? Hive's estimated open rate predicts the open rate of an email before you send it based on the targeted recipients. Choose to include or exclude subscriber groups to see how this affects the overall estimated open rate of the email. 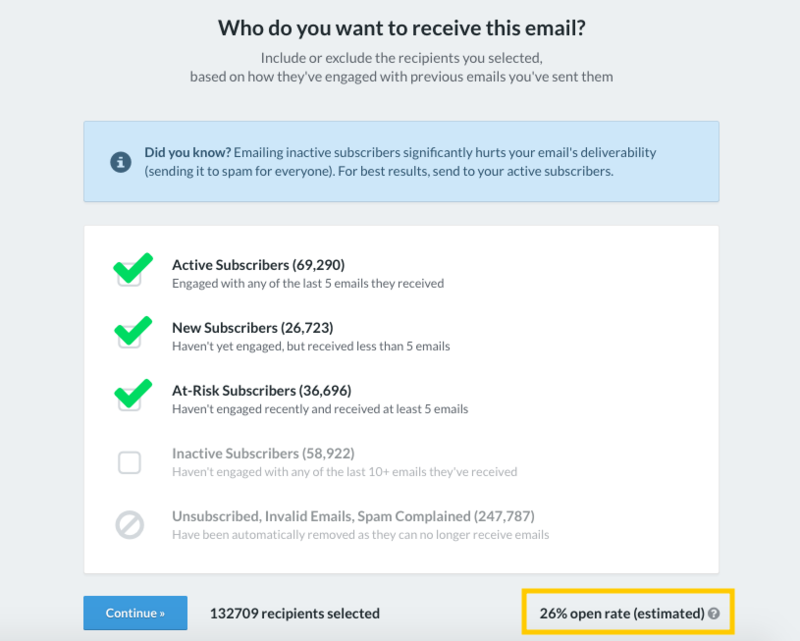 If you've sent emails to these recipients in the past, the estimated open rate will look at the open rate of the previous emails you've sent to those recipients. In the case of new subscribers who you've never emailed before, the estimate is based on the historical open behaviour of your new subscribers. The estimated open rate also considers the fact that even active recipients may naturally become less engaged over time. Sending an email to a large number of unengaged recipients (inactive, bounced, etc.) will affect the engaged recipients also receiving the email. One consequence of doing so is poor inbox placement for all recipients. On the other hand, if you're sending an email to mostly engaged subscribers, the less active recipients may benefit from better inbox placement. Not sure what a good open rate is? Find out here. If the email you're about to send performs like other emails you've sent to these recipients, then you should expect the open rate we're predicting. Of course, emails can always perform better or worse than average!